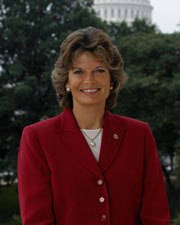 MURKOWSKI, Lisa, (daughter of Frank Hughes Murkowski), a Senator from Alaska; born in Ketchikan, Alaska, on May 22, 1957; attended public schools in Fairbanks, AK; attended Willamette University in Salem, Oregon, 1975-1977; B.A. in Economics, Georgetown University 1980; J.D., Willamette College of Law 1985; attorney; member, Alaska Bar Association; Anchorage District Court attorney 1987-1989; private practice 1989-1996; Mayor's Task Force on the Homeless 1990-1991; Anchorage Equal Rights Commission 1997-1998; Alaska State house of representatives 1999-2002; appointed to the U.S. Senate on December 20, 2002, to fill the vacancy caused by the resignation of her father, Frank H. Murkowski; elected to the U.S. Senate in 2004; unsuccessful candidate for renomination in 2010, but subsequently elected as a write-in candidate in the November 2, 2010, general election, for the term ending January 3, 2017; reelected in 2016 for the term ending January 3, 2023; Republican Conference vice-chair (2009-2010); chair, Committee on Energy and Natural Resources (One Hundred Fourteenth through One Hundred Sixteenth Congresses). "Lisa Murkowski," in Women in Congress, 1917-2006. Prepared under the direction of the Committee on House Administration by the Office of History & Preservation, U.S. House of Representatives. Washington, D.C.: Government Printing Office, 2006.